So, we get it: New York is famous for their pizza. And the Statue of Liberty. And the Empire State Building. And Wall Street. And, well, honestly a bunch of other things. BUT, FOOD-WISE, New York is famous for their pizza. However, let’s not disregard another great option that a New Yorker or tourist can indulge in when they order using cheap food delivery. That option is Chinese food, a New York classic. So next time you’re craving pizza in New York City, take a second to explore your options and avoid eating pizza for the 15th meal in a row. But, if you do, there will be no judgment on our part. Enter FoodBoss’ judgment-free zone and check out all the delicious Chinese restaurants New York has to offer! The first place we’ve got for you regarding cheap food delivery deals for Chinese grub is Asian Wok. Asian Wok is a great spot that has a ton of great, eclectic options that will satisfy every Chinese food connoisseur. When you order from here, make sure to get the pork with broccoli. It’s the perfect combination of protein and veggies that will actually make your meal out (or ordered in, I suppose) both healthy and tasty. The pork is roasted to perfection, and it’s juicy, thick, and exploding with flavor. The broccoli is quite good as well. It soaks up the pork’s juices, so there’s really not an overwhelming “broccoli taste”. It’s also steamed, so the texture is soft and amazing. Even broccoli’s biggest haters will enjoy it! Moving on, we have Sichuan Hot Pot Cuisine, which is some truly incomparable Chinese food in the Big Apple. Experience it the right way using FoodBoss to get some fantastic food delivery deals. You should also do it by way of General Tso’s Chicken. It’s a Chinese classic, and Sichuan Hot Pot Cuisine does it just about as well as anyone else. It’s all you could ever want from some General Tso’s; it’s crispy, sweet, got just the right amount of savoriness, and comes with rice and veggies. Game. Set. Match. Last (and certainly not least) we have Char Sue. Char Sue is the place you most likely think of when you think of good New York Chinese food. It’s an affordable Chinese restaurant, yet it’s also got some prime gourmet options, too. Order from here and check out the Roast Duck. It’s a house specialty, and it’s a meaty, juicy duck rubbed with Sichuan Spice, and it’s served with fresh herbs, lettuce, and pickles. It’s an immensely satisfying and filling meal that will satisfy all your Chinese food cravings for a reasonable price if you order using cheap food delivery. 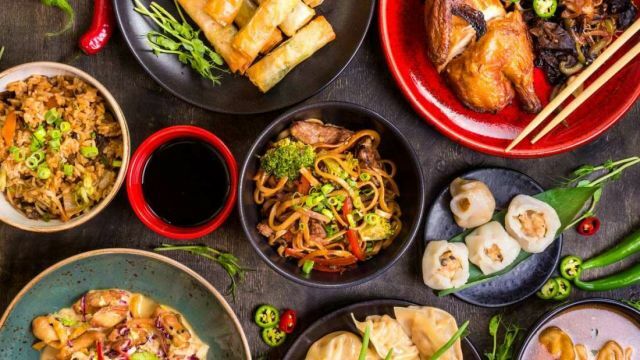 Capitalize on these food delivery deals and eat some of the best Chinese food in the world (well...outside of China.) It’s fast, easy, and your taste buds will surly thank you for taking them across the world with an incredible culinary experience!